As a player, Dikembe Mutombo made a big difference for his teams with his signature shot-blocking skills. Now, eight years after his retirement from the NBA, the Congolese native is still making a difference in society. His philanthropic activities around the world keep him busy. On Friday, the former NBA star and Naismith Memorial Basketball Hall of Fame center, visited the B. League office, where he greeted league chairman Masaaki Okawa in his role as a global ambassador for Special Olympics. Special Olympics is the biggest sports organization in the world for children and adults with intellectual disabilities. It provides training and competition opportunities for them. Mutombo, who has been known for his extensive humanitarian work since his days as a player, has been a global ambassador since 2012. The 51-year-old also serves as special assistant to NBA commissioner Adam Silver and global ambassador for NBA Cares, the league’s global social responsibility program. The B. League, which was launched last year as a new men’s top circuit, has a similar program called B. League Hope. Cooperating with the Nippon Foundation and Japan Basketball Players Association, it has worked on some humanitarian and charitable activities. The eight-time NBA All-Star insisted that it is important for professional basketball to get away from the court and promote social activities because one day they are going back to be a part of the community. 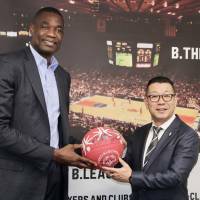 Mutombo encouraged Okawa to do the same for the B. League’s players. Meanwhile, Mutombo is glad that more players have gotten involved in social activities now. He said that there were only a few devoted to them during his playing days. Mutombo proudly added that all the charitable endeavors and donations he’s done have inspired other NBA players. “I think so many of our players want to follow the legacy, making a difference in the community,” said Mutombo, who was selected by the Denver Nuggets with the fourth overall pick in the 1991 NBA Draft and played for six teams in his 18-year career. “And getting out from their arena and going to the community can relieve some of the stress of basketball,” the four-time NBA Defensive Player of the Year said. 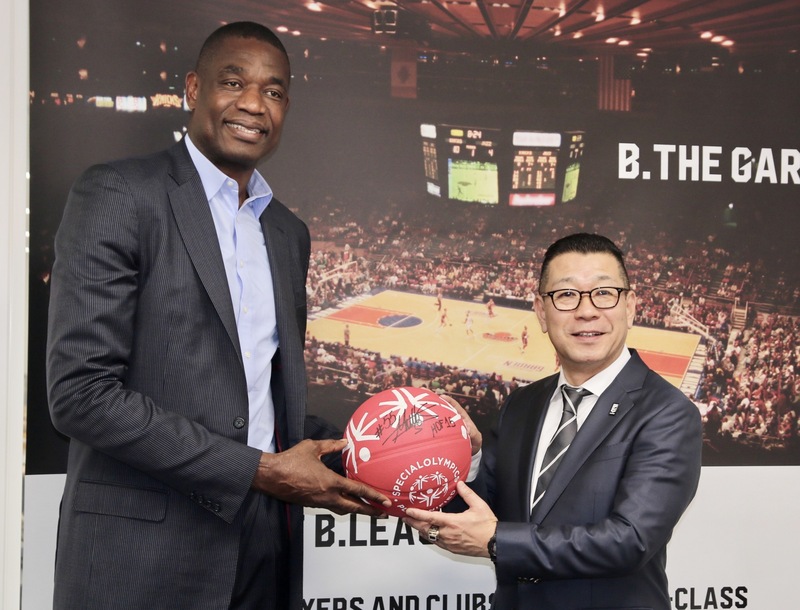 Okawa said that the league felt “honored” that a Hall of Famer like Mutombo visited its office. In January, Okawa and some other league officials visited NBA headquarters in New York to learn about its operations, including NBA Cares. Okawa said that Mutombo’s visit indicates that the B. League is gradually gaining recognition by the NBA, something he is pleased about. “Going forward, we could do some collaborations with our B. League Hope (and NBA Cares),” Okawa said. “We are going to have to set our goals toward what the NBA does in many different aspects. Mutombo attended Saturday’s B. League game between the Alvark Tokyo and Levanga Hokkaido at Arena Tachikawa Tachihi in Tokyo. Before the Alvark-Levanga game, a “unified game,” in which players with and without intellectual disabilities formed teams and competed in a demonstration contest, was staged for spectators. Toyota Motors, the Alvark’s parent company, announced on Thursday that it would become a global partner for Special Olympics starting in 2018.